The Department houses the theater, dance and music programs. Theater is a transfer program designed for students interested in careers in theater or in the teaching of drama, and includes training in acting, directing and make-up, and in costume, stage, set, and lighting design. Students learn both through class work and participation in theatrical productions. The music program prepares students for professional careers as performers or teachers of music, combining hands-on performance experience with traditional classroom instruction and an electronic computer-assisted music lab. The dance program offers students an opportunity to develop or enhance their skills and techniques in all areas of dance (jazz, ballet, modern and Afro-Caribbean). Performance opportunities include the Repertory Dance Theater and an annual student-choreographed program. Several student performing groups are supported by the department and are open to all campus students through audition. Different groups – such as the woodwind, brass, and guitar ensembles, the Hi-Lites choral group, Gospel Choir, the College Choir and the Jazz Band – perform both on and off campus. 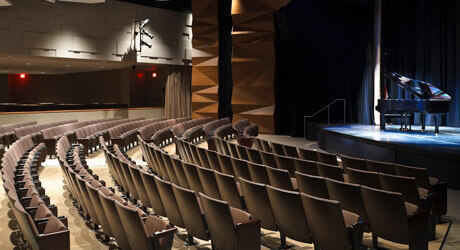 Many of these performances are held in the Lehman Theatre at the Pawley Creative Arts Center, one of the finest performance facilities in the area. Before completing the usage request, please check the theatre calendar for conflicts. If the dates and times needed appear available, complete and submit the theatre form.